In 1984, the Gitxsan people, along with their neighbors the Wet'suwet'en, embarked on a long journey that would be known as the Delgamuukw aboriginal title case. This Supreme Court of Canada decision established hopeful new tests for the content and proof of aboriginal title and allowed the Gitxsan the opportunity to prove legal entitlement to their territory. At the same time, the Gitxsan saw it necessary to develop an alternative model for the management of their land, one predicated on long-term sustainability. 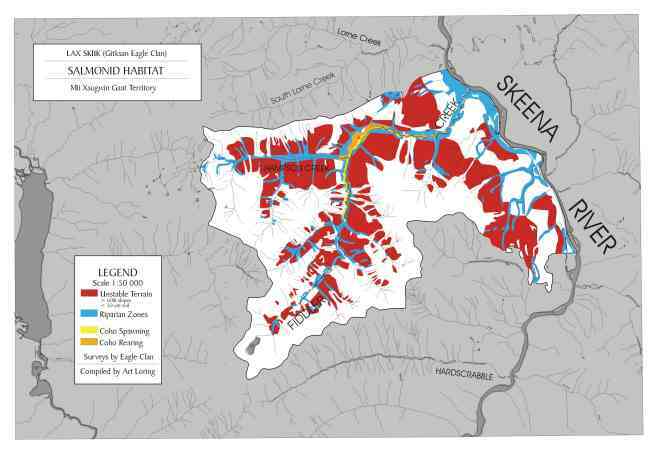 This report presents the ecosystem-based planning model developed by the Gitxsan Strategic Watershed Analysis Team (SWAT) for the Gitxsan territories in northwestern British Columbia, Canada. This report describes why this model represents one of the best community forestry solutions in British Columbia today. Gitxsan territory is in northwestern British Columbia, east of Prince Rupert. 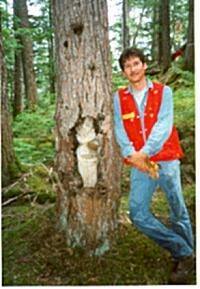 Ecologically, Gitxsan territory includes extensive old-growth forests and numerous unlogged watersheds. Wildlife is abundant and includes populations of grizzly bear, black bear, fisher, wolverine, northern goshawk, trumpeter swan, pine marten, marmot and mountain goat, bull trout, and tailed frog. The Skeena watershed and its tributaries form one of the larger Coho runs in British Columbia, which is endangered. The main threat has been industrial forestry, which has resulted in extensive clear-cuts and roads across Gitxsan land, the loss and degradation of wildlife and habitat, and a constant undermining of Gitxsan ways of life and opportunities. Gitxsan territories fall mainly within the Kispiox Timber Supply Area (TSA), an administrative area managed by the provincial Ministry of Forests for the purpose of expediting industrial logging. The British Columbia government allows over 1,000,000 m3 of wood to be logged from the Kispiox TSA each year, an amount that the government admits exceeds the long-term sustainable level of harvest by almost 75 percent. Almost all logging is done by clear-cutting. The Gitxsan have meticulous records of over 400 referrals on cut blocks and road layouts in which the Gitxsan requested changes to logging and road layout plans to protect the environment, wildlife habitat, and Gitxsan cultural values changes, which the Gitxsan say are necessary for them to exercise their aboriginal rights. With rare exceptions, all of the Gitxsan's requests for better management of their land have been ignored by the Ministry of Forests, contrary to the government's fiduciary obligations to the Gitxsan. In response, the Gitxsan have waged an unrelenting battle to protect their land and culture from destruction. Their courageous efforts, documented in the 1991 film Blockade, managed to keep industrial logging out of one Eagle Clan territory for many years, but only temporarily. This strong nation may be known best for their decade of battles and victories in the courtroom. Most recently, the Supreme Court of Canada ruled that aboriginal title must be recognized as a distinct property right to land, capable of overriding all other interests including logging. For British Columbia First Nations, the decision finally offers an opportunity to prove legal title to unceded land. For the British Columbia government, the decision challenges the current treaty process predicated on aboriginal extinguishment of land rather than entitlement. For environmentalists and forest activists, which include Gitxsan persons, the decision marks an opportunity for legal resistance to industrial logging and other pressures on Gitxsan land. For the community forestry movement, the decision represents a significant fissure in the rigid tenure system, with the possibility for the people who live on the land to make decisions about how it is managed. For Gitxsan people, the decision is the latest victory in an ongoing mission for cultural, ecological, and economic long-term survival. With t he Delgamuukw decision allowing the Gitxsan to prove legal entitlement to their territory, the Gitxsan saw it necessary to develop an alternative model for the management of their land, one predicated on long-term sustainability. 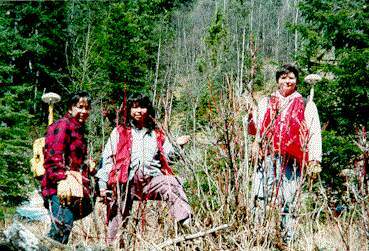 In 1994, the Gitxsan SWAT resumed work on an ecosystem-based plan for Gitxsan land. SWAT determined that the best way to stop the large-scale destruction of the forests, salmon, culture, and social health of the people was to develop a sustainable ecosystem-based community forest model. The SWAT modeling project also mapped "defensible information" that could be used in court to demonstrate legal title to the land. Delgamuukw does not immediately award the Gitxsan rights over their territory. First, the Gitxsan must prove their claim to aboriginal title in court, and once they do, legally they will hold right to entitlement. In order to prove aboriginal title, they must document evidence of use and occupation of the land. Thus, the Gitxsan Model is a mapping strategy that has two linked objectives. The second objective (entitlement) leads to the implementation of the first objective (the alternative model). Delgamuukw, therefore, means that unlike other community forestry proposals in British Columbia, the Gitxsan Model actually has the potential of legally being implemented. The Gitxsan Model is an ecosystem-based plan that maps where and how any logging or activity may take place on Gitxsan territory. Unlike conventional timber planning, which allocates cut blocks primarily according to short-term political and economic criteria, the Gitxsan Model studies first the ecological and cultural requirements for long-term sustainability. This is done through the overall examination of a series of inventory maps for various ecological, biological, and cultural indicators. SWAT has spent years in the field collecting biological, ecological, and cultural inventories and using GIS technology to map this information. SWAT has inventoried and mapped particular species and resources that are representative of the whole ecosystem. These include grizzly bear, moose, and salmon. In addition, SWAT has inventoried and mapped for such conditions as soil and terrain stability, age and condition of forests (such as old growth), the health and quality of salmon-bearing waterways, as well as nontimber resources such as pine mushrooms and berries. Inventories have also been conducted for culturally significant values and areas. For centuries, the Gitxsan have hunted and trapped pine martens, wolverines, mountain goats, black bears, grizzly bears, and marmots, as well as fished and collected a wide range of plants for food and medicinal purposes. Gitxsan territory is criss-crossed with trails to hunting, gathering, fishing, and trapping areas as well as seasonal and permanent camps, village sites, and culturally modified trees. Evidence of the Gitxsan's occupation and use of their traditional lands is extensive and beginning to be well documented on maps. More than 400 days of oral testimony on the Gitxsan's occupation and use of their territories was provided by Gitxsan people as part of the court battle that led to the Delgamuukw decision and is being used by SWAT for the mapping project. The inventories transect both horizontal and vertical landscapes-from the soil layer to the top of the forest canopy. Morover, a goal of the work is to transect time. SWAT plans to use both terrestrial ecosystem mapping (TEM) and predictive ecosystem mapping (PEM) to move different kinds of planning scenarios forward and backward in time. The objective is to move far beyond five-year development plans and 60- to 80-year timber rotation cycles that dominate current Ministry of Forests planning to a model that more closely resembles how an ecosystem functions. This type of technology is not being employed by the British Columbia government, which continues to use outdated forest cover maps that account for no other criteria beyond timber to make decisions about where and how much to cut. The Gitxsan Model is a comprehensive examination of the ecosystem, its structure, its function, and its components. Based, then, on the overlay of these maps, the plan determines important and sensitive sites as well as areas suitable for ecologically responsible forest use. To date, a tremendous amount of information has been collected on the structure, composition, and function of ecosystems for Eagle Clan territory in the Skeena West area and the Wolf and Frog Clan territories in the Babine area (Map 3). These planning areas comprise approximately one-sixth of the Gitxsan territory. Appendix 1 of this report contains four example maps specifically for the Skeena West planning unit. The grizzly bear map shows the range and habitat for resident grizzly bears. Information was collected through aerial surveys, forest cover maps, intensive surveys of grizzly bear trails, and "strip" mapping (the process of walking a transect and recording detailed observations of habitat use along the transect). The salmon map was compiled through a detailed ground survey of salmon spawning and rearing areas. The berry map is based on both detailed ground observation and interpretation of forest cover maps. The timber map shows areas where ecoforestry could be practiced on stable terrain without compromising other values. 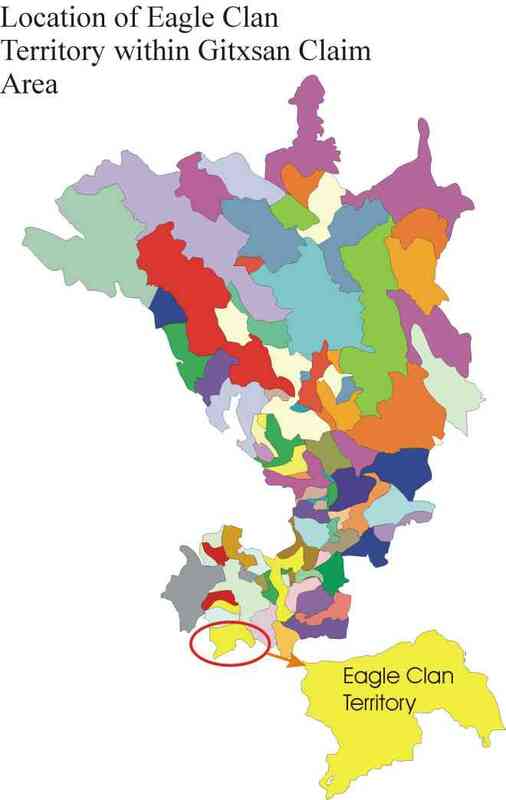 Thus far, SWAT has produced over 50 maps using GIS to portray the location and extent of indicator species and resources within these two planning areas. The information base for these planning units now includes a remarkable amount of information, from soil layers to the top of the forest canopy, combining both traditional ecological knowledge and modern resource uses. The Gitxsan Model is a plan for the entire landscape and considers whole watersheds, biodiversity, animal migration patterns, critical habitat, and the traditions and culture of the Gitxsan nation. Gitxsan "houses," or wilp territories, generally conform to natural watersheds. All house members are responsible for the health of the wilp territory. The Gitxsan First Nation is composed of approximately 60 wilps, which are extended family clans with ownership and responsibility over the wilp's territory (see Appendix 3). Gitxsan identity is defined by the interrelated wilp structure and is deeply rooted in the land. While establishing planning areas according to watersheds or other ecosystem-based boundaries makes ecological sense, these boundaries clash with the Ministry of Forests timber-based planning regions. The Gitxsan Model, when implemented, would assist in overcoming current barriers to ecologically sustainable planning. Ecosystem-based planning was developed by forester Herb Hammond and to date has been adopted by 10 communities in British Columbia. The Gitxsan Model is one of the most comprehensive of these plans, as it integrates the traditional ecological knowledge (TEK) of the Gitxsan people with modern science and information systems. The Gitxsan approach to management is inclusive and cooperative. The Gitxsan do not intend to exclude others from being involved in, and contributing to, the sustainable management of their lands. Once the Gitxsan prove entitlement, they will hold significant legal authority over their territory; Delgamuukw recognizes aboriginal title as a distinct property right to land, capable of overriding all other interests including logging. However, the Gitxsan wish to work with local nonaboriginal communities as well as existing tenure holders to develop cooperative management agreements that respect and comply with the ecosystem-based plan. An agreement struck with the Kitwanga Lumber Company, a small locally owned licensee holding tenure on Gitxsan land, allowed Art Loring and his team to practice ecoforestry. More recently, the Gitxsan Eagle Clan and Kitwanga Lumber Company proposed a joint venture whereby the company agreed to develop a plan with the Eagle Clan for ecosystem-based mapping, protection of sensitive and culturally significant areas, horse logging, and other forms of ecoforestry. Unfortunately, the Ministry of Forests rejected the venture on the basis that it would seriously reduce the region's wood supply and the size of the operable land base. Later, Kitwanga was sold to Repap, which had a poor record of consultation with the Gitxsan and is now insolvent. Nonetheless, this case offers a rare example of a local tenure holder and a First Nation working together to reconcile the interests of timber, culture, and ecology. Gitxsan have always sought outside expertise and opinion and thoughtfully incorporated the input of others in order to determine the best possible management approaches for their land. For example, the SWAT team has worked closely with Herb Hammond to develop ecosystem-based mapping and management approaches. Within the Eagle Clan territory, Art Loring, who trained under Herb Hammond, has trained members of his community to practice ecoforestry. The Gitxsan have brought in many experts from outside the community not only to help with the development of the model but also to equip members of the community with the skills and capacity to continue the work on their own. The Gitxsan team and its growing array of volunteers and community members are fully trained in GIS wildlife and biological inventory, GIS mapping, and ecoforestry along with a host of other administrative, business, and management skills. As the model expands into other house areas, SWAT transfers capacity to the members of those houses so the process is conducted and led locally. It enables an expansion of self-sufficiency, awareness, capacity, and involvement throughout the territory. Despite many years of hard struggle, costly legal battles, and numerous setbacks, the Gitxsan remain remarkably positive that they can and will establish good working relationships with the nonaboriginal community. The Gitxsan want to work with the nonaboriginal sectors of the community to develop tourism opportunities and other strategies for community economic diversification and value-added production that will benefit both aboriginal and nonaboriginal communities in the region. The Gitxsan have entered into discussions with the provincial government to develop a legal framework for implementing the Gitxsan Model, and these discussion are ongoing. SWAT is the technical arm of the Gitxsan. A registered, not-for-profit society, SWAT is charged with developing long-term sustainable resource management solutions. One step in developing a new relationship with government and industry is the articulation of our own lands and resources management model in light of Gitxsan aboriginal rights, ownership, and jurisdiction. SWAT is accomplishing this with a series of innovative projects designed to build local capacities, seek out new relationships and partnerships outside the Gitxsan communities, and provide technically sound and culturally relevant alternatives. Our products are a creative fusion of the best of both Gitxsan and non-Gitxsan worlds that all sides participate in. We have many projects currently under way.